Every Dandy’s favorite time of year is the annual Buffalo Tweed Ride! Each year the BLRC Tweed Ride is met with the same vivacious revelry from those brave souls willing to endure the elements and show off their tweediest outfits. The weather is looking to be slightly warmer than last year (which is great) I only hope the flu that’s been plaguing me the last few weeks finally clears up by then so I can participate. At the very least the BD family will be there taking photos before the ride commences. This is definitely one of those events in Buffalo that shouldn’t be missed. Hope to see everyone there! Time once again to push forward our clocks and make way for Spring. 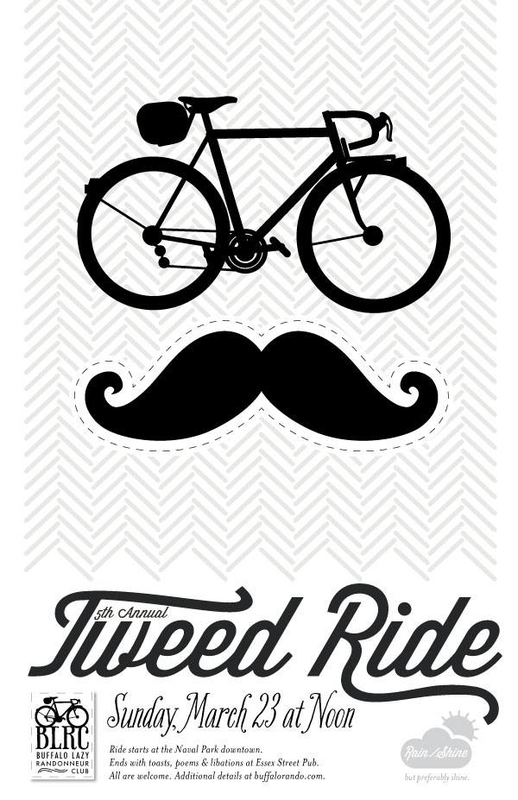 In celebration of the coming season we invite all to gather for our notable fifth annual BLRC Tweed Ride. As is our custom we shall commence from our fair waterfront park at the Naval Park at noon on the first Sunday of Spring. An easy pace will take us along bike paths to Hoyt Lake in Delaware Park. Once there we will continue our frivolous tradition of selecting whom among us is best outfitted for the ride. We shall award the wittiest, prettiest and one we love most with a fair portion of Limburger Cheese for their efforts. Afterwards we invite all to the Essex St. Pub so we may properly toast the season, each other and the fine activity of cycling in our beloved town. We hope to see many familiar and new friends excited for Spring after this chilly Buffalo winter. As always we recommend that each participant follow all cycling rules and safety suggestions. We each shall be responsible for our own equipment and well being. Please extend this invitation to all your friends. Cannot see you soon enough! There’s one of these coming up in Albany. Where can I get tweedy clothes at a reasonable (super cheap) price? Salvation Army? Salvation Army/Goodwill/Amvets are the perfect places to get some tweedy threads. Most places you can get at least a jacket for just a couple bucks. Plus if it doesn’t fit you can always get it tailored relatively cheap and the it will still be cheaper than going out and buying a new one. Take photos of the ALB ride, I’d love to see it. Be sure to invite my brother in law. I’m sure he’d love to go with you guys.